Get acquainted with the E:L stack and working with the different beats: Filebeat, Packetbeat, Metricbeat, Auditbeat, Heartbeat, and Winlogbeat. The ELK Stack, which traditionally consisted of three main components (Elasticsearch, Logstash, and Kibana), has long departed from this composition and can now also be used in conjunction with a fourth element called Beats: a family of log shippers for different use cases. It is this departure that has led to the stack being renamed as the Elastic Stack. This tutorial provides a guide for those just getting acquainted with the stack and provides information for getting started working with the different beats: Filebeat, Packetbeat, Metricbeat, Auditbeat, Heartbeat, and Winlogbeat. In centralized logging, a data pipeline consists of three main stages: aggregation, processing, and storage. In the ELK Stack, the first two stages were traditionally the responsibility of Logstash, the stack's workhorse. The idea of outsourcing some of Logstash's responsibilities also came into being, especially the task of data extraction to other tools. As I describe in this article, the idea first manifested itself in Lumberjack and later in the Logstash forwarder. Eventually, a few cycles of development later, a new and improved protocol was introduced that became the backbone of what is now called the Beats family. Beats are a collection of lightweight (resource-efficient, no dependencies, small) and open-source log shippers that act as agents installed on the different servers in your infrastructure for collecting logs or metrics. Filebeat, as its name implies, is used for collecting and shipping log files and is also the most commonly used beat. One of the facts that make Filebeat so efficient is the way it handles backpressure — so if Logstash is busy, Filebeat slows down its read rate and picks up the beat once the slowdown is over. A network packet analyzer, Packetbeat was the first beat introduced. Packetbeat captures network traffic between servers and, as such, can be used for application and performance monitoring. Packetbeat can be installed on the server being monitored or on its own dedicated server. Packetbeat tracks the network traffic, decodes the protocols, and records data for each transaction. The protocols supported by Packetbeat include DNS, HTTP, ICMP, Redis, MySQL, MongoDB, Cassandra, and many more. You can configure the frequency at which Metricbeat collects the metrics and what specific metrics to collect using these modules and sub-settings called metricsets. Heartbeat is meant for "uptime monitoring." In essence, what Heartbeat does is probe services to check if they are reachable or not — it's useful, for example, to verify that the service uptime complies with your SLA. All you need to do is supply Heartbeat with a list of URLs and uptime metrics to send to your stack, either directly to Elasticsearch or to for enrichment before indexing. Auditbeat is a beat that is also still defined as being in experimental stages and can be used for auditing user and process activity on your Linux servers. Similar to other traditional system auditing tools (systemd, auditd), Auditbeat can be used to identify security breaches — file changes, configuration changes, malicious behavior, etc. There is also a long list of beats developed by the community. These, of course, are not supported in any official way but are worth exploring if relevant for your use case. The list of community beats includes beats for AWS, Apache, Cassandra, Docker, GitHub, and many more. Installing the various beats is super simple. Most likely, you've already set up one of the other components in the ELK Stack, so you should be familiar with the commands. Configuration files are usually located in the same directory — for Linux, this location is the directory. For Filebeat, this would be /etc/filebeat/filebeat.yml. For Metricbeat, this would be /etc/metricbeat/metricbeat.yml. And so forth. Generally speaking — and again, the exact structure may differ depending on the beat in question — the configuration file will include two main sections: one defines what data to collect and how to handle it, the other where to send the data to. The prospector is where you define what log file to track — its path, its type, encoding type, and any other processing steps you would like to apply. You can define multiple prospectors per Filebeat or multiple paths per prospector. You can add custom fields to each prospector, useful for tagging and identifying data streams. The output section informs Filebeat where to send the data to — in the example above, we are defining a Logstash instance, but you can also define Elasticsearch as an output destination if you do not require additional processing. I am using the Docker module, defining what specific statistics I want shipped (called metricsets), adding a custom env field and shipping directly into Elasticsearch. Some Beats, such as Filebeat, include full example configuration files (i.e. /etc/filebeat/filebeat.full.yml). These files include long lists all the available configuration options. Sections are separated by a long line of # (hash) symbols. As much as this sounds funny, don't mistake these for commented-out configuration lines. The - (dash) character is used for defining new elements — be sure to preserve their indentations and the hierarchies between sub-constructs. Modules only take care of the "what" and the "how," not the "where to" — you will still need to configure the output section. Each module comes with a set of files containing module-specific configurations, field definitions, and sample Kibana visualizations. Modules have default configurations, which will most likely be fine in most use cases. You can see these default settings in the /etc/<beatname>/module.d directory (DEB). Once you've configured your beat, you are ready to begin enjoying the wealth of information they collect. 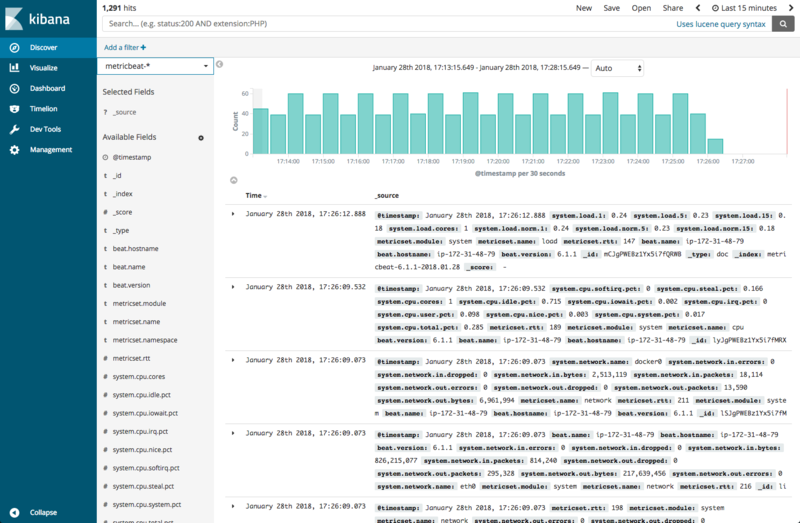 Within seconds, a new index will be created in Elasticsearch, which you can define in Kibana to begin analysis which is the simplest way to make sure your beat is working correctly. Beats by no means replace Logstash. Users often get confused as to how the two interact. Beats acts as a lightweight log shipper for specific use cases, while Logstash is responsible for the heavy lifting, acting as an aggregator and processor. You will most likely use them together, especially when using Filebeat for collecting and processing log files. Beats are extremely versatile and easy to use, and the addition of modules makes them even more feature rich. In this tutorial, I provided only the tip of the iceberg — the different beats contain specific usage instructions and configurations which are worth exploring. Happy YAMLing, and keep the beat going, guys!